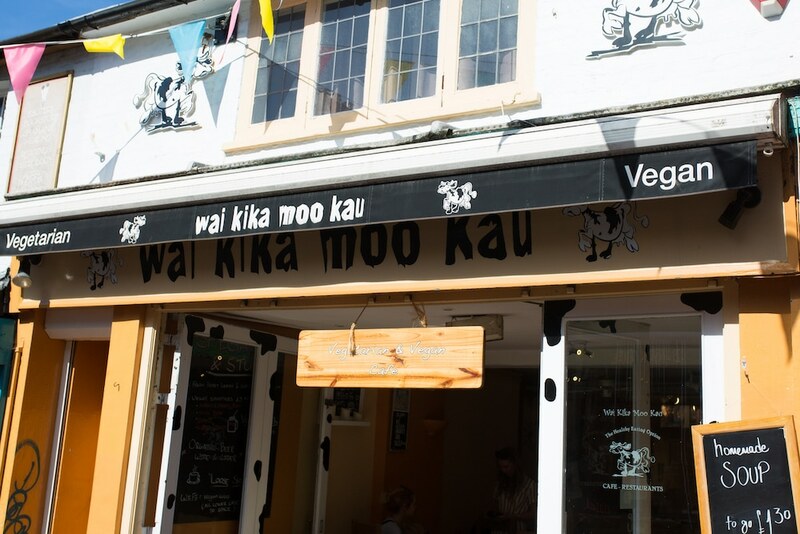 With its cow-patch splotted exterior, it’s hard to miss the wacky Wai Kika Moo Kau when you are wandering through the North Laine. Buzzing with people on a Saturday lunch time, the interior is bustling and warm and a little bit higgledy piggledy which suits the cafe’s name. 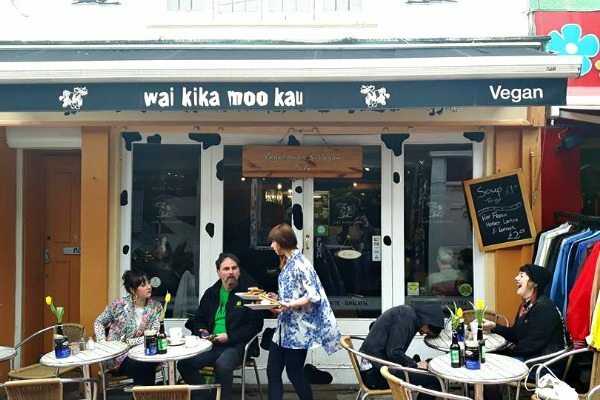 The menu describes itself as international and is totally vegetarian, with vegan options available for most dishes. 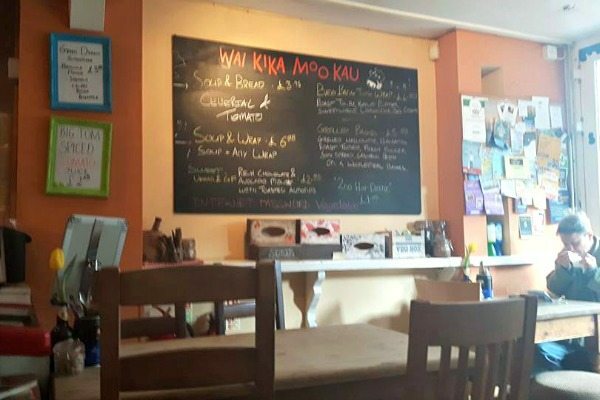 The food itself ranges from pancake stacks for breakfasts, burritos and pittas for lunch and homemade burgers and mezze and tapas platters in the evening. My friend and I walked in around midday and settled into a seat, both of us ravenous from a lack of breakfast having decided to save our appetites for the occasion. To drink, we both opted for a spot of tea and a milkshake each. Both had the vegan option of soya available, which I tried. The milkshakes were sweet and flavoursome but slightly resembled Nesquik. For brunch we both went for the WKMK Full Breakfast, but I chose the vegan option. 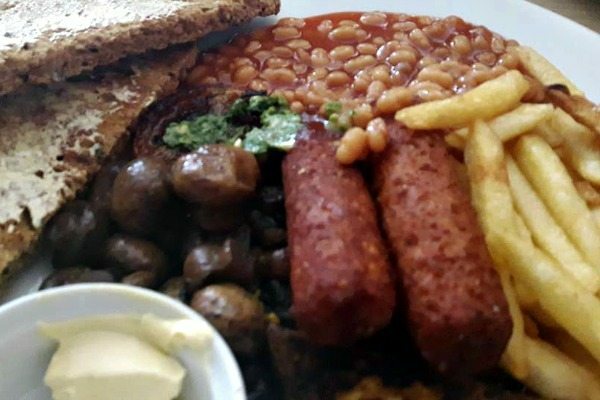 The breakfast is a smashing, satisfying serving of well-cooked comfort food. It comes with a portion of crispy chips, which is always welcome. There’s a lot to be said about a good slice of toast to mop up a Full English, and the toast served was gorgeous high quality granary bread with poppy and sesame seeds dappling the crust. There was a dollop of rocket pesto placed on the cooked tomato which broadened the flavours of the dish for a fleeting moment before it was gone. 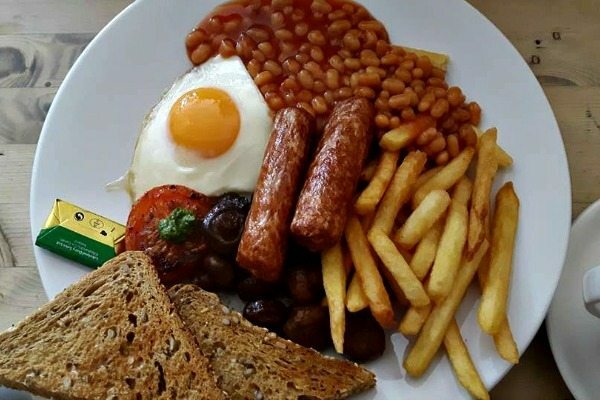 It would have been nice to have a bigger serving of this because it gives an interesting dimension to the Full English, but before you have time to appreciate it you have devoured it. The main difference for the vegan option was the switching of egg for tofu, which was sadly a little overdone and had too much of a chewy texture which actually resembled egg white. The vegan sausages were delicious though. 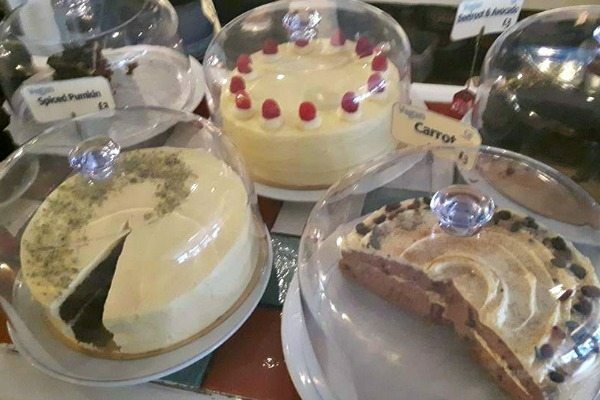 After those gigantic portions we thought there was no way we could consider looking at – let alone eating – dessert, but the cakes on offer at the counter were so unique we simply had to order some to take away. Feeling bold and intrigued, we bought a slice of the wacky-sounding beetroot and avocado cake. I am very sorry to say it did not work. 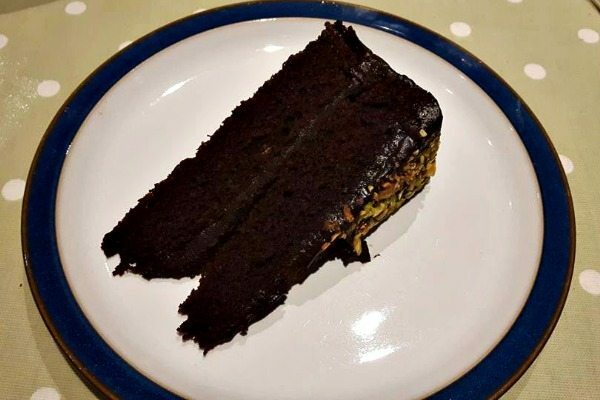 The cake itself was heavy, not particularly sweet and it left the mouth with a sharp metallic tang which was not pleasant. I say this with a heavy heart because it looks scrumptious, we were really rooting for this cake! But all was forgiven when we tasted the raspberry cake (bought from a staff recommendation). Where the previous cake was too heavy, this was light while being lip-smackingly moist and popping with raspberry flavour. The icing was to die for. It tasted like buttercream and conjured memories of being able to lick the bowl out of a mix of butter and sugar – always my favourite part of baking. 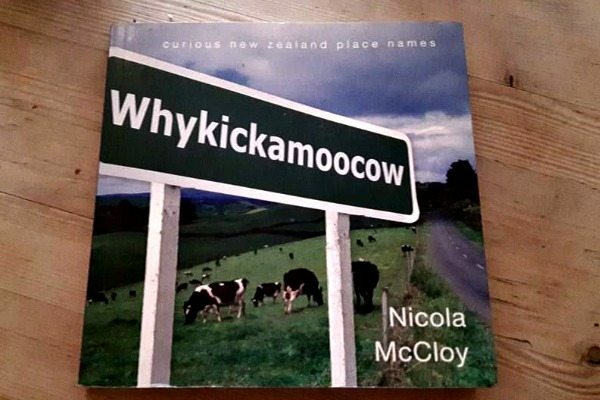 Wai Kika Moo Kau has a lot to offer. The service we received was just lovely – the staff were enthusiastic, friendly and happy to help and chat to you. And the food itself was affordable, huge portions and (though sometimes a bit hit and miss) on the whole had a real feel-good factor. Definitely worth a wander inside.